Today I will explain you how to create a basic Movie review engine based on the tweets by people using R.
For our case we only consider Text feature of the Tweet as we are interested on the review of the movie. We can also use the other features such as Latitude/Longitude, replied to, etc. do other analysis on the tweeted data. Removing Url links, Reply to, punctuations, non-alphanumeric, symbols, spaces etc. 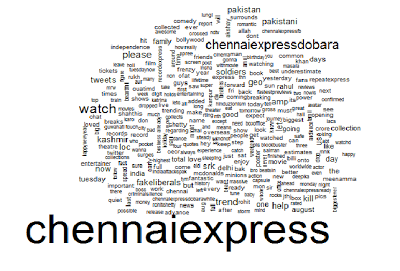 At this point let us view Word-Cloud of frequently tweeted words in the data considered for visual understanding/analyzing the data. In this step, we create use a Dictionary of words containing positive, negative words which are downloaded from here. These 2 types of words are used as keywords for classifying the each tweet into one of the 4 categories: Very Positive, Positive, Negative and Very Negative. To Build a Movie Review Model which can classify a new tweet as and when provided?